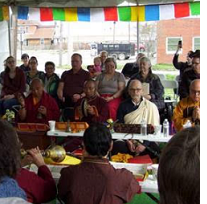 Three years after their building burned down, Columbus KTC Buddhist Meditation Center began their rebuilding. 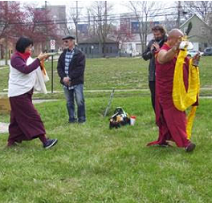 On Sunday, April 7, they held a ceremony to bless the land where their original building stood in Franklinton. 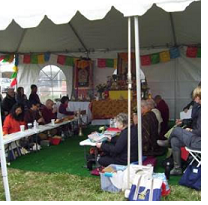 The event was led by a contingent of lamas from Karma Triyana Dharmachakra, KTC’s home monastery in Woodstock, New York. 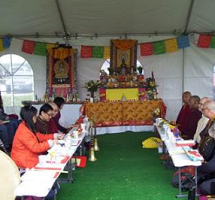 The lamas led the assembled members of KTC in a litany of Tibetan prayers and then blessed the land with traditional rituals. The official groundbreaking followed with Lama Kathy Wesley, KTC’s resident teacher; Kim Miracle, Board President; and Peter Macrae, new building architect, turning the first shovelfuls of dirt. The event marked the end of a long period of fundraising that showed the center’s commitment to staying in Franklinton, where they’ve been since 1990. They plan to be in their new building by this time next year.